Organising Committee: Queensland Rowing Association. Joshua T Bell (Chairman), F J Purney (Honorary Treasurer), Philip L Frankel (Honorary Secretary). Margins; 1/2 length with Queensland some way back. 1st VIC – Bow: W H Hatch, 2: Arthur J Shepherd, 3: A H James, 4: D Christie, 5: F J E James, 6: W A Adams, 7: J A Brotherton, Str: R B "Bob" Nicolson, Cox: A E Hobson, Cch: W Bray. Average weight 11st 10lb. 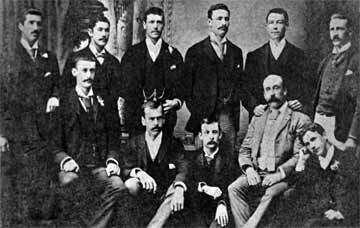 2nd NSW – Bow: R W Thomas, 2: Henry Y Braddon, 3: John Degotardi, 4: A H Aldworth, 5: Walter Moore, 6: B Sawyer, 7: Horace C Waters, Str: Frederick C Moore, Cox: J (Sid) Hellings, Cch: Nick Johnson, Mgr: Arthur Holmes, Selectors: C Dobson, N Johnson and W Martin. Average weight 11st 11lb. 3rd QLD – Bow: F J Hickie, 2: F W Gore, 3: B J Beirne, 4: A J Westaway, 5: Arthur H G Drury, 6: Colin B P Bell, 7: E Colclough, Str: R T Hilder, Cox: Dan E Joyce, Emergs: Frank Lyons & J S Jessop, Cchs: J T Bell & R H Roe. Average weight 11st 7lb. This was the last Victorian crew selected by George Upward’s committee. It stood aside following the adoption of an amateur status definition at the intercolonial conference of 1888. The Queensland crew drew the worst station and combined this with a bad start to never be in the race. 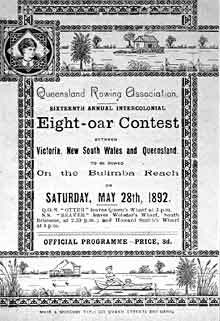 The Victorian and New South Wales crews had a great race. 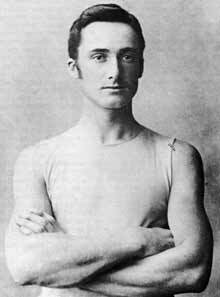 Slack of Queensland also took the effort to travel to Melbourne to take the Victorian Championships in 1892. Perhaps his win convinced the Victorians to stay at home rather than travel to Queenland to compete?